Considering all of the indulgences associated with St. Patrick’s Day, I thought I’d offer up some lighter fare; a dish that is every bit as celebratory without the dehydration and crash associated with excess alcohol and sugar. This hearty salad is made of a wealth of green foods including nutritional powerhouses like kale, avocado, and parsley. As I was making my green juice the other morning, I became curious about blending the juice with avocado. I know this is a thing that people do, but I always thought that if I’m going to add fat and fiber, I may as well just make a smoothie instead of a juice. When I blended it up though, it was so creamy and smooth. It was very light, too. I totally get why avocado is a popular add-in at juice bars. I was going to drink it, but because of its thickness I thought it would work well as a salad dressing. It worked beautifully! And because my juice had kale in it, you’re getting an extra dose of kale in the salad! -Chop the kale and place in a bowl. 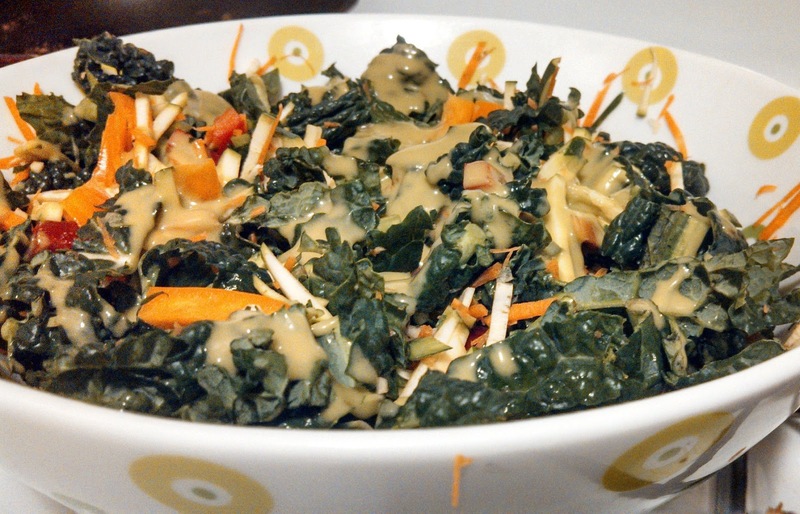 -Shred the zucchini and carrot, julienne the bell peppers, and add all to the bowl of kale. Toss. -Combine 16 oz of green juice with 1 avocado in a blender and blend until it’s creamy. *If you have more than 16 oz of juice, drink the rest! It’s delicious. **You don’t need to massage the kale as lacinato kale is not as tough or bitter as green and red kale are. However, if you want to massage the kale, you will want to toss in the chopped and shredded vegetables after you’ve massaged the kale.